Right Worshipful Richard W. Burgess of North Reading and a member of Good Samaritan Lodge of Reading was installed Deputy Grand Master for the year 2000. A Past District Deputy Grand Master of the Malden 7th Masonic District, he has been the Director of Public Relations for the Shriners Burns Hospital in Boston for the past five years. A third generation Mason, he is the son of Bro. Melton M. Burgess and grandson of Bro. Stearns Burgess, both members of Good Samaritan Lodge, but neither ever held office in the Lodge; Bro. 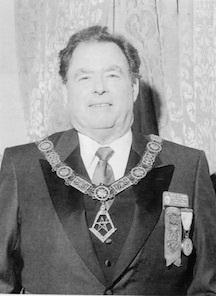 Richard served as the Worshipful Master in 1977-78. He was raised in Deering Lodge No. 183. Portland. ME in 1967 and affiliated with Good Samaritan Lodge in 1968. Brother Burgess is a Senior DeMolay of Middlesex Chapter in Reading and holds the degree of Chevalier. He was Chapter Advisor, succeeding his father, who was Chapter Advisor for 20 years. Born in Boston, raised in Reading where he attended public schools and graduated from Memorial High School, he attended Tufts and Northeastern Universities. He served in the United States Army Security Agency with duty in Korea and California. He has had experience in insurance investigation, real estate, non-profit development and public relations. He is a member of the Public Relations Society of America, the American Medical Writers Association. Massachusetts Society for Medical Research. Massachusetts Broadcasters Association, Massachusetts Statewide Coalition of Juvenile Firesetter Intervention Programs, S. A. F. E. Grant Advisory Board. Department of Public Health's Fire Safe Families Committee and the Greater Boston Fire Prevention Coalition. He is a member of the Scottish Rite. Valley of Boston. His York Rite memberships are with Reading Chapter. Melrose Council and Reading Commandery. As a member of Aleppo Temple he has been active in the Clown Unit since 1981. He was editor of Clown Alley, the magazine of the international Shrine Clown Association. He has been chairman of the Shrine Circus and was one of the originators of the Shrine Rodeo. Brother Burgess and his wife. Dea-Ann (Kerr), have lived in North Reading for 30 years where they attend the Aldersgate United Methodist Church. He had been active in Little League Baseball and Pop Warner Football. They have four sons. Kevin, Scott and Chris who are married and Tim. The Burgess family looks forward to a seventh grandchild in June. One of the interests of Bro. Burgess is sculpture, primarily of clowns. Among his collection of 150 pieces is his figurine of Lou Jacobs, the famous Ringling Brothers Circus performer, which is in the collection of the Clown Hall of Fame. Grand Master, distinguished head table, and Brethren all. It's such a pleasure to be here tonight for many reasons. This is such a wonderful time of the year. Every time, about this time of year, I am reminded of the writings of Joseph Fort Newton, who was a Masonic scholar, and with whom, I am sure, many of you are familiar. He writes on when is a man truly a Mason. He states that when a man is truly a Mason, he can find good in every faith that helps any man lay hold of divine truth and find deeper meanings in life, whatever the name of the faith may be. And, as we know, many faiths have been celebrating this particular season. But I also wanted to thank some of our Past Deputy Grand Masters who, in the last twenty-four hours have been so helpful with their advice and their comforting guidance. They were particularly helpful, and offered three words of advice, Keep it short! One of them even offered me his watch. He said put it there on the podium and watch the time and make sure you don't run over the allotted time. I looked at it and it was a sundial. I come here tonight filled with gratitude and excitement about this year. I am humbled and filled with humility. Thank you Grand Master for the confidence you have placed in me. I hope that each of you here is filled with excitement for this new year, the year 2000, and will work with the Grand Master and the Grand Lodge to promote Freemasonry throughout the world. Thank you. This page was last modified on 23 September 2016, at 07:37.